Washington, Dec 15 : US Secretary of State Hillary Clinton wants India and Pakistan to resume their peace dialogue and discuss everything, including Kashmir, since the security of both the countries is threatened by terrorists. But while the US would encourage India and Pakistan, problems between the countries can be "solved by the two countries themselves having that kind of ongoing dialogue," she said in an interview with Pakistan's Samaa TV last week, according to a transcript released by the State Department. Asked about Pakistan's perceived concerns about India's engagement in Afghanistan and its alleged support to militants in Balochistan province, Clinton said it was in the interest of both countries to address all issues in an open way. "Well, we think, very strongly, that it is in both Pakistan's and India's interest to get back to a dialogue and to try to address every one of these issues in an open way. It is not in India's interest for Pakistan to be destabilised," she said and "It is not in Pakistan's interest for Afghanistan to be destabilised." 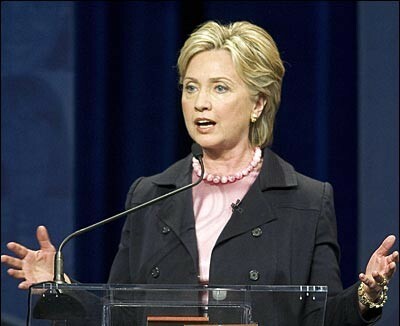 "This neighbourhood is now at risk because of the presence of terrorists who wish to destabilise India, Pakistan, and Afghanistan," Clinton said suggesting that Pakistan based terrorist outfit Lashkar-e-Taeba had staged the 26/11 Mumbai terrorist attacks to provoke war between the two neighbours. "So the historical issues that, certainly are very significant between India and Pakistan, have to be addressed by the two countries, because otherwise you will think the worst of each other, and terrorists will try to create war between India and Pakistan, because that would further their gain as they did with Mumbai," she said. Asked if the US will encourage Pakistan and India to solve some of the old problems, like Kashmir, Clinton said: "Yes, absolutely." But "We know that no one on the outside can solve these problems. It can only be solved by the two countries themselves having that kind of ongoing dialogue." "So we've encouraged both Pakistan and India to resume that dialogue and to talk about everything, including Kashmir, because now the security of both countries is threatened by these forces of extremism." "And I believe that a lot of these terrorist groups are funded, directed, equipped, and trained by outside forces, not people from Pakistan, not people from India, but people who wish to see the two countries at - in conflict, and I think that is so critical to avoid. And the only way to avoid it is by getting back into a dialogue," Clinton said. In another interview with Watandost. com, she said an international effort by US, China and European Union could at best be a guarantor but an impetus for a dialogue must come from the two countries themselves. "I think it could be a guarantor or it could be a positive force for implementation. "But I think that the impetus must come from the two countries themselves," she said.